With breathtaking views along the Rhone Valley, the resort of Crans-Montana is a top choice amongst well-heeled skiers with its luxury hotels and gourmet restaurants and hosts the Caprice music festival in April each year. The ski area is an intermediate’s paradise with red runs making up the majority of the piste map. 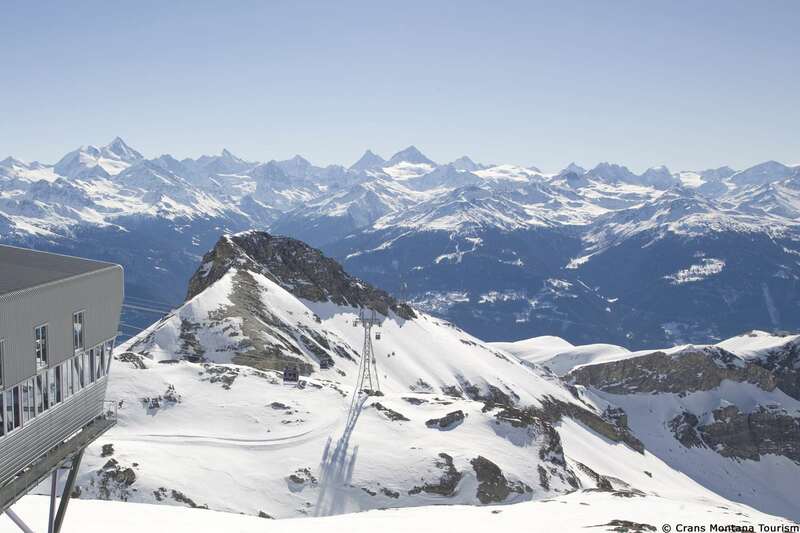 With a glacier reaching up to the resort’s high point, Pointe de la Plaine Morte, Crans Montana boasts 140km of pistes as well as the Space Adrenalin snow park and a good choice of off-piste runs for more advanced skiers. Wide pistes on the mountain suit beginners who are ready to move on from the nursery slopes in the resort. The glacier is also the location for one of the cross country trails, and there are 65km of winter walks around the area. If you tire of the slopes here you can make your way to the top ski resorts in Zermatt, Saas Fee and Verbier by road or rail. There are some snow making facilities across the pistes in Crans-Montana to add to the natural snowfall for more guaranteed skiing throughout the season. Crans Montana is a popular resort throughout the year, so there are a wide variety of apres ski activities for non-skiers, ranging from snow golf, horse riding and delightful cleared walks around the golf course and in the forest. Supermarkets are good, and there are plenty of shops and boutiques. There are over 80 restaurants in Crans-Montana, offering many different cuisines, along with bars and nightclubs, and a casino. Children’s facilities are adequate. The Fleur des Champs crèche and kindergarten takes infants from three months, making for a friendly family ski holiday resort. 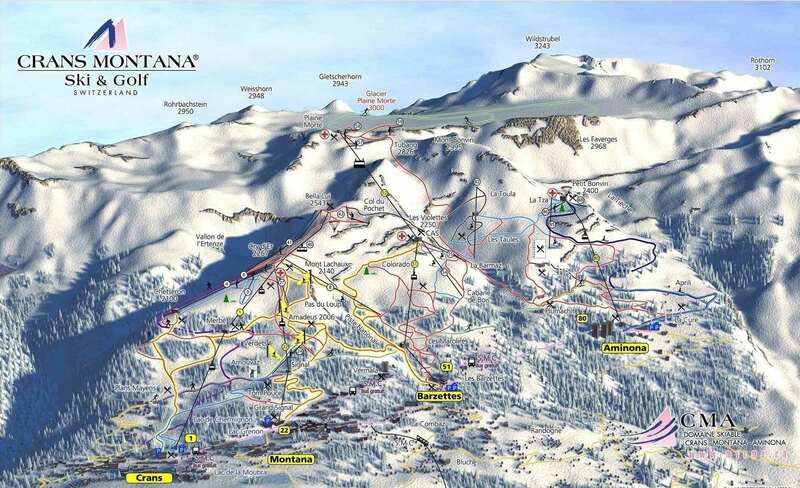 Split into two resort centres – Crans to the west and Montana the east – the resort has a wide choice of après activities with a good selection of bars and restaurants as well as designer shops. Further east is Aminona, a smaller village surrounded by forest which has a long toboggan run. Enjoy a special meal at Le Montblanc in LeCrans where you can also take in fantastic views of the surrounding mountains, or head to the Michelin-starred L’Ours. There are several airports accessible via car or bus transfer the closest being Geneva which is 182 km away. One of Switzerland's 'Best-Kept Secrets', with the Rhone Valley below. A beautiful area with good high altitude skiing & boarding. Not enough ski-lockers available at peak times. Also surrounded by even higher peaks for skiing, in Zinal and Nendaz. Great 6km. tobaggann run. Some good restaurants, but would benefit from more variety, as most seem to be Italian. Visited for 10 years now and liked it so much bought a property there, to use in summer as well, as it is easy to travel there, with their excellent transport.